We are freshly returned from Toronto and very glad to finally be able to get some sleep - there was none to be had in Toronto - especially on Wednesday night when everyone dumped onto the streets to celebrate Canada's Olympic men's hockey victory over Russia - did not really quiet down until well past midnight - we had a blast however. Do you think you have a great Magic: The Gathering story? Wizards of the Coast wants to hear how Magic is part of your life today. Tell us a true story about Magic, and the most creative, unique, and relevant one will win a trip to Pro Tour–San Juan, May 27-30, 2010. The first-place prize includes travel and accommodations for yourself and a friend. A second-place winner will receive travel and accommodations for him- or herself. * What is the most fun you've ever had playing Magic? * How long have you been playing Magic and what keeps you coming back for more? * How have you helped your Friday Night Magic community evolve? * Has Magic: The Gathering changed your life for the better? * How has Magic affected other parts of your life? * Where is the most unique place you've played Magic? Winners will be notified by April 5, 2010. Entries will be judged on creativity, uniqueness, and relevancy. And some linkys for you guys as well . 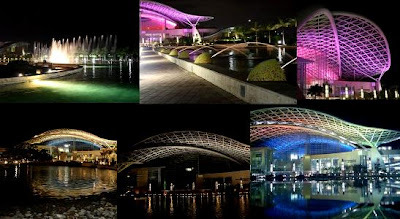 . .
> Best of luck to those who are going to take a stab at this - we don't get out much and would very much like a break from the ordinary - the Puerto Rico Convention Center looks great - BUT as we are not legal US residents, we are not able to participate and need to find another way to get down there. Still trapped in Toronto for a week of meetings which means we may not be able to get regular daily posts up on MTG Realm - so hang in until we return back to the mothership in Barrie by week's end. Anywhoos - odd thing happened tonight. We trudged across the street from the hotel we're staying at to our new fav game store (401 Games) to get a couple of cards and we bump into a buddy from Barrie - wow. Especially so if one considers the population of Toronto is about 2.5 million and the GTA (Greater Toronto Area) is around 5.6 million - we assume the improbable but guess local gamery stores are strong magnets for MTG fans and should expect to bump into someone we know from time to time. Right - anyways, our buddy 'Anakin' was able to oblige us and we did a round of decktesting with the new builds we have going. Anakin's Kor tech and blue-white build were rather brilliant so much fun was had. 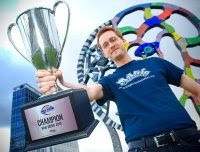 Speaking of deck tech, make sure you check out these videos from WoTC from the recent Pro Tour-San Diego 2010 last weekend where German player Simon Görtzen Jund build took him to the top. The Player field looked like this . . .
Righto - The Deck Tech we had promised earlier . . .
First up - Craig Wescoe shows off his unique take on White Weenie which propelled him to an 8-2 record in the Standard portion of the Pro Tour. And . . . Lucas Florent shows off his updated to Eldrazi Green for Standard. That's it for now - we hope to get another post off tomorrow. We are trapped in Toronto this week on business but thankfully they have coffee down here and a connection to the interwebs. We don't think we will go into Magic the Gathering withdrawal either as 401 Games & Collectibles is within walking distance from our lair away from home. Not sure if we will be able to get daily MTG posts to the blog but we will do our best. 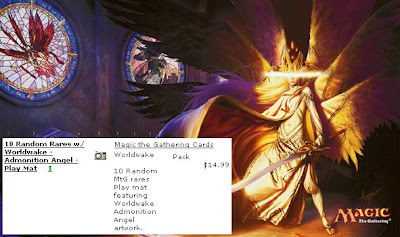 Anywhoos - We finally got around to putting together a real cardboard Magic the Gathering deck for the new post-Worldwake Landfall. The deck we had finally scrapped together for playtesting is Green / White featuring Emeria Angel, Rampaging Baloths and Avenger of Zendikar. Right off the get-go, let's have a look at the video and then we'll get to some notes . . .
To date, we have had only two playtest dates with this build - one against a mon-red (Red-Deck-Wins build) as well as an interesting mono-green Elf / Ally deck. Both matches show some promise and we will be taking notes for improvement. We were initially taken by surprise just how many plant, bird, and beast tokens this particular build vomited out on the board. We guess we should not really be that surprised as Knight of the Reliquary (to search for any land - basic or otherwise) and Ruin Ghost (which temporarily bounces lands back to your hand) does a fairly decent job in dropping extra lands into play triggering all those awesome landfall abilities. We had taken out Oran-Rief, the Vastwood and it appears the wheels did not in fact fall off. The land that really did impress us was Sejiri Steepe - especially when coupled with Ruin Ghost which when used in tandem is kind of like a 'protection on tap' and worked quite efficiently for us. Another land which did not yet really shine for us in this build was Stirring Vastwood - this man-land may eventually get pushed off into the sideboard. Well, we're certain it has quite a bit to go to get this FNM ready but one important goal has already been reached - this is one heck of a FUN casual deck to play. Stay tuned, not sure exactly when the next post will be but we are off to 401 Games right now - if you happen to be in the hood, we will be hanging out there for several evenings this week. Today's post is all about one of the more epic cards to hit the tables in the last year or two. This card also happens to be the first Planeswalker to have not three but four abilities. Since Worldwake came out, players everywhere are cracking packs to either find this awesome piece of magic card or looking on with envious eyes to that player who just did. If you know that we're yattering about Jace, the Mind Sculptor, you are correct and should treat yourself to a latte. We were very fortunate to crack a Jace during our Release party and since then had become rather interested in the player community's response to this card. To start off, here is a brief quote from Evan Erwin, StarCity Games Community Manager and well known host of the popular 'The Magic Show' on the tube. This is what he had to say in his recent article titled 'Five Lessons From Worldwake' . . .
"You think $60 is the highest it's going to reach? Pssshhh. My guess is $80 after the Pro Tour, and will hit $100+ after it rotates. I'm happy this article is here, because it will let me look back in a few months to confirm my thoughts or prove me incredibly wrong. I've got a hankering, however, that I'll be proven right and then some." And those prices . 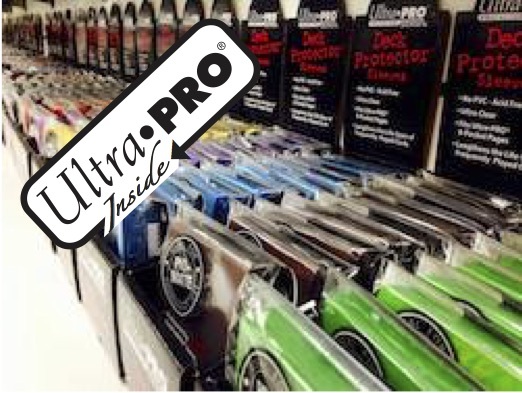 . . here is a quick round up of what to expect to pay for a single non-foil : Note - a price listed here has may likely change within a few hours of this post going up. Soooo - We suggest that you follow StarCity Games to get a true feeling for the price and how Jace will move up (or down - not likely) in the next coming months. As for eBay - prices for 'buy now' range from $45 to $55 dollars US. If you are looking to sell your much coveted Jace, we suggest that you trade it with another player to get a load of cards you need to complete decksets, etc., or wait until after we have seen this on the Pro-Tour circuits for a bit at which time we will prognosticate that there will be a price correction - going up in value that is. Now for some juice . 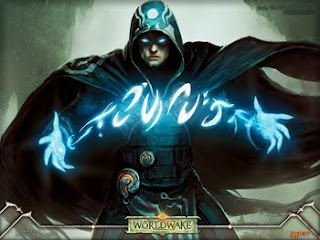 . .
We finally got around to putting together a real cardboard Magic the Gathering deck for the new post-Worldwake Kor. Those equipment loving white weenies just got a whole lot better with with Stoneforge Mystic. With the Mystic on board, a deck builder may now significantly reduce the slots in the deck for equipment and fill these spots with other threats or answers. Right off the get-go, grab some popKORn and watch this short video . .
We suggest that you guys check out Jacob Van Lunen's article, entitled 'Equip and Swing!' posted yesterday on Wizards. It was because of this article (and the results of some MTGO results) we had included our only non-Kor Kritter, White Knight. With the ability to find the new equipment hotness, Basilisk Collar, which provides deathtouch and lifelink, we would have a heavy preference for a first or double striker to bowl over fatties on the other side of the table. You should note that this deck will be evolving with the local metagame and may very well include a provision for Kor Skyfisher bouncing sejiri Steppe back into our hands to double the capacity of times we call protection against a given colour. Admonition Angel, Conqueror's Pledge, Marshal's Anthem, White Knight, Armament Master, Kor Aeronaut, Kor Firewalker, Stoneforge Mystic, Kor Duelist, Journey to Nowhere, Brave the Elements, Harm's Way, Emeria, the Sky Ruin, Tectonic Edge, Sigil of Distinction, Quietus Spike, Whispersilk Cloak, Trailblazer's Boots, Basilisk Collar, Trusty Machete. We really are looking forward to using a double-equipped Kor armed with Quietus Spike and then a Whispersilk Cloak to swing in and drop our opponent's life big time. Anywhoos - here's hoping the planets will align on this. 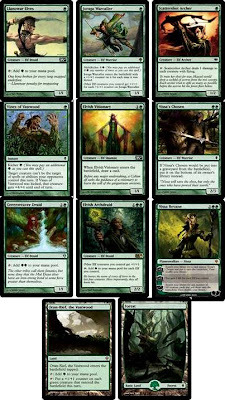 We will run another video soon featuring a green-white token build featuring Plants, Ants, Birds, and Beasts . . . so like stay tuned eh. Not too much happening in the way of Magic the Gathering news. We have been running a series on casual deck ideas - these are decks which use at least 50% fresh mix from Zendikar and Worldwake. Stay tuned for more of these coming up - we are not even close to getting through some of the fun builds one can have. For today however, we have some nice news to report - We finally got our Worldwake pre-order ! Yep - a truckload of new Worldwake card goodness was waiting in our mailbox yesterday. We usually get our singles from a very well known on-line retailer in Florida (CoolStuff Inc.) and it typically takes just under two weeks (8 to 10 business days) to get to our sorry frozen a$$ here near the north pole. Anywhoos - out of all the cards we had pre-ordered, our most anticipated order was not a card at all - it was a playmat. We are rather deprived and have never owned a playmat. As we sometimes take our cards to unsavoury places to play, we felt we would be better served to disinfect a playmat instead of 60 individual cards. Righto - the playmat - we have a thing for the new Worldwake Admonition Angel (perhaps not the most epic card in this set, but the card is decent enough and we loves 'em that sweet art by Steve Argyle. Sooo - we ordered that deal which they (the retailer) sends along 10 very random rares along with the playmat. We did not have very high expectations for the random rares but really did not care very much as we felt the playmat was just about worth it on it's own. Here's what we got . . .
Randoms with approximate cost : Lord of Tresserhorn ($1.50), Junkyo Bell ($0.50), Soulblast ($0.50), 2 x Hikari, Twilight Guardian ($0.50), 2 x Vassal's Duty ($0.50), Relentless Assault ($0.50), Spellweaver Volute ($0.50), Akuta, Born of Ash ($0.50) . . . We'll be sticking these in our bicycle spokes when the snow melts and the glacier recedes out of the mall parking lot. We will start showing some real cardboard mtg casual standard builds with fresh Zendikar / Worldwake and report back to you guys how well they fared. This Rise of the Eldrazi Booster Box description had been let out of the bag for a week or two now . . . . In their quest to uncover ancient treasures, Planeswalkers have awakened the Eldrazi - parasite titans of the aether, imprisoned on Zendikar for thousands of years. Seemingly unstoppable, these world eaters threaten all of the Multiverse and their very presence has changed everything you know about Zendikar. To survive, you'll have to be at the very top of your game. Rise of the Eldrazi is set 3 of of 3 in the Zendikar Block. Whoaz. That's heavy man. Dark and choatic times are ahead for the denizens on the plane of Zendikar. And you just know that these uncouth Eldrazi will be tracking icky aether all through the kitchen . . . erggh. "Hey guys - what are you doing?!" "Saving the universe mom . . . from the Eldrazi"
"Again? - OK, have fun. Don't forget to let the cat back in." Yep - pretty much win from where we're sitting - stay tuned to MTG Realm for more nonsensical and witless posts. G'Day folks, hope all survived Valentine's Day. We will be taking a short break from our Worldwake casual 'Deck Ideas" series and hook you up with these very nice Magic the Gathering iPhone Wallpaper by Joey Pasco. - Admonition Angel Wallpaper - Epic Art is Epic ! - Steve Argyle rocks ! Stay tuned for more fun 'n' exciting MTG posts folks. With the newest Magic the Gathering set now out, Worldwake, there appears to be a lot of players out there looking to either build a new deck or tweak an existing one. The next deck idea up is post Worldwake Elves. Following are our ideas for two Elf variants - we had not the heart to suggest the number of each card to run - we leave this up to you to tweak and test. Llanowar Elves - The original lawnmower elf is still kicking it ramp style. A perfect one drop to accelerate your game. Joraga Warcaller - We suggest you DO NOT drop this on turn one - or even turn two for that matter - you want to be able to multikick the heck out of this to pump him and all your other Elves. You may want to test ways to dump +1/+1 counters on him (like Quest for the Gemblades or Strength of the Tajuru). Scattershot Archer - Great card to keep the skies clear of flying bird tokens (a la Emeeria Angel) - trouble is, this card is not that great until you get a Basilisk Collar on him - now we're cooking with a timmy point of deathtouch to any flying critter. Vines of Vastwood - great instant to temporarily give one of your critters shroud-lite and a solid boost to boot. Elvish Visionary - Card draw equals card advantage in our opinion - having no cards in hand equals little or no options. Nissa's Chosen - Even without the Elf Planeswalker, this guy is not that bad. Great chump blocker who will almost always find its way back into your library. Greenweaver Druid - Stage two booster rocket for mana acceration - you may not really need this unless you decide to run some big green fatties late game. Elvish Archdruid - Great Elf Lord who not only pumps your elves but also serves mana salad. Nissa Revane - two positives are great for a P/W. Your options are to chump out a critter or life gain - not bad. The third ability is likely to be totally devastating to your opponent. I have seen the third ability resolve at least thrice - it's controller won each game. Oran-Rief, the Vastwood - great pump from a land and a favourite card among many running a green deck. We suggest you align the planets to get an additional counter on Joraga Warcaller. > There are not a whole lot of support in the Elf Ally folder in Worldwake - mind you, we think these are some fairly decent cards to kick some additional synergy into an Elf build but we think this will see a lot of play in casual fun decks. Again ally builds really need a truckload of allies. Nature's Claim - situational but may prove worthy depending upon how dangerous that artifact or enchantment is. Canopy Cover - We love this aura. Shroud and limited evasion is plain good. Vastwood Animist - time to animate some land. We prefer to use Awakener Druid to churn out a 4/5 Treefolk but this card may have its uses. Tajuru Archer - again, this card becomes more dangerous with the more allies you have on the table. Joraga Bard - meh. vigilance until end of turn. Turntimber Ranger - We like this guy. Whenever an ally hits your side of the table, this gets pumped and pukes out a 2/2 wolf token. Strength of the Tajuru - This may be sweet with Joraga Warcaller. Anywhoos - Whichever your casual build takes you we hope you have a ton of Vampire fun - tweak this, take this out for a spin at the kitchen table or to your FNM and get back to us with your comments, feedback or constructive criticism.